← Knocking on Doors and Merry Christmas! It’s a good New Year’s resolution: Read the Bible this year. 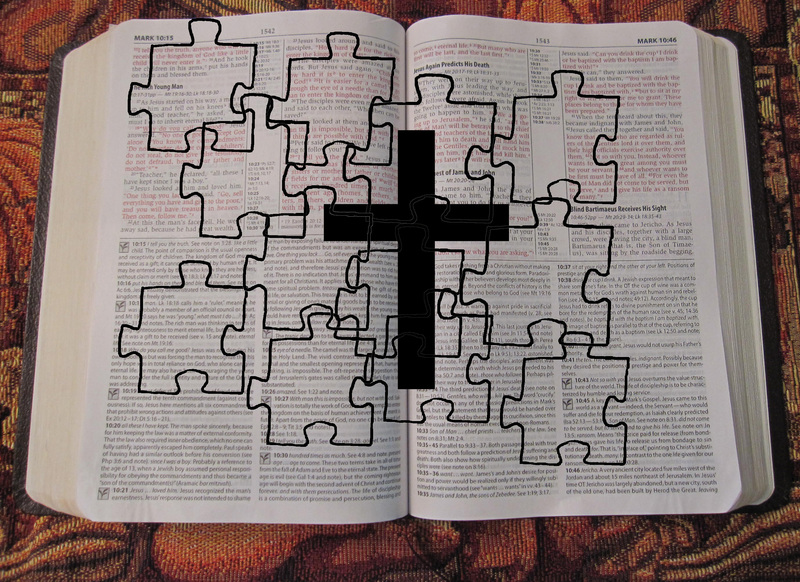 Maybe you’ve tried it before and haven’t gotten too far, or maybe you’re familiar with the Bible and yet reading it feels like trying to put together a complex jigsaw puzzle without the benefit of the completed picture on the box top. The Bible is a lengthy, complex, and deeply challenging book to read and understand. It was written over a period of roughly fifteen hundred years by dozens of authors in three different languages. To further muddy the waters, the books are not arranged chronologically making a linear reading of the story difficult. Imagery is unfamiliar and our translations don’t always communicate the nuances of ancient languages. Add to that the vast cultural differences between then and now, and it’s no wonder we get confused. It is also the inspired Word of God and a magnificent expression of the character, love, and work of God in and through human history. There are great rewards for those who persist. Here are four suggestions to help you begin to read and understand the Bible. 1. Just do it. You have to start somewhere so just jump in and start reading, if possible with the help of a good Bible study to help you place the particular book you are reading within the larger context of the Bible. My understanding of the Bible has been informed by the excellent materials and format of Community Bible Study. If there is a CBS class near you, take advantage of it! 2. Pray. Really. The Bible is far more than a story, deeper than literature, and light-years beyond self-help advice. It is supernaturally powerful, and will only be understood with the help of the Spirit of God. The protagonist of the biblical story is God himself; let His Spirit inform your reading. 4. Start with Jesus. All of the Old Testament points to Jesus, the Gospels are the accounts of his earthly life, death and resurrection, and the rest of the New Testament is the history and writings of the Apostles as they began to follow their Savior. Jesus is the focal point of the entire Bible. I once worked a jigsaw puzzle of a mountain scene with a lighted cabin as its focal point. Starting with the lighted cabin I began to place pieces around it, and eventually it was complete. Jesus is the complete picture of the Bible. Start with Him and the pieces will fall into place. Do you regularly read the Bible? If not, why not? If so, how do you put all the pieces together? 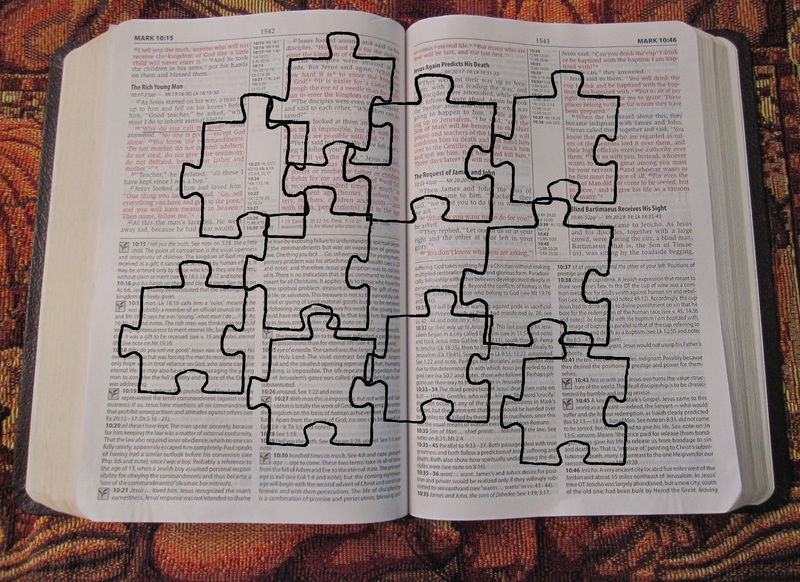 Gallery | This entry was posted in Jesus, The Bible, Theology and tagged Bible, Puzzles, Reading the Bible. Bookmark the permalink. First of all thank you for stopping by and following my blog. I am using the Bible App so I am reading the Bible each day and always doing some plan as well. God’s Word is giving me peace and deeper faith. Wish you all the best for 2016 and God’s blessings! It has been a while since I read the bible in one year – our church is doing it this year for Sunday School – I know I am up to the challenge! I try to read the Bible every day, but even more than that, I try to memorize and meditate on scriptures every day, too. My goal is to fulfill Jesus’ words in John 15:7 “If you abide in Me and My words abide in you, you will ask what you desire, and it will be done for you.” I want my prayers answered! His words do abide in you, Larry. It’s obvious to me! You are a true teacher, Judy. Clear, disarming, inviting, untangling…doable. Thank you for these informative and encouraging words. Absolutely true, Shannon. I read a Bible reading plan, lately it’s my own, most days, but I can’t quite say every day. I always manage to read the whole Bible in a year, however, and I’m always so glad I did. Starting over soon! Happy New Year Shannon!